So Upper Deck continues to scrounge all of the Marvel Universe for more content to feed it's never-endering Legendary Deck Building game system. I thought we had reached peak crazy with things like the Deadpool-themed expansion, but we also got ourselves a Legendary game devoted to the cult classic Big Trouble in Little China. So yeah, the announcement for Legendary: Noir based on the Marvel Noir universe wasn't something that I had expected. I was familiar with the comics given I at least read Spider-Man and Daredevil. But that didn't quite feel like enough to really create a whole game expansion around. But hey, looks like I was wrong and here we are with Legendary Noir, which is a surprisingly good expansion and one that ads a nice flavor to your games. This also marks the first time Uppder Deck has decided to release promo cards with first edition releases as a way to drive up initial sales I guess. Good thing we got a copy early. Legendary Noir is a small box expansion for the core Legendary: A Marvel Deck Building Game. This expansion was created by Devin Low and provides 100 new cards that are generally compatible with other Legendary games. Like other small box expansions, this edition adds 5 heroes, 2 masterminds, 2 villain groups and 4 schemes for your use. Thus you can now face Charles Xavier, the Professor of Crime, together with his X-Men Noir team or The Goblin, Underworld Boss, and the Goblin's Freak Show. 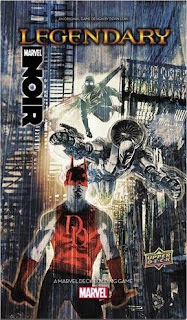 To help you in your fight you get support from the noir equivalents of Iron Man, Daredevil, Luke Cage, Spider-Man and Angel. The set adds a few interesting new keywords to change-up gameplay. Investigate helps heroes uncover the mysteries of the game where you name a card type (color) and draw the top two cards of your deck to see if you draw what you need. Hidden Witnesses are yet another way for bystanders to get in trouble, but this time they are dealt face down on heroes and can only be rescued by spending 2 Recruit points. A villain with Hidden Witnesses cannot be attacked until the witnesses are secured. This does not change the behavior of other Bystander cards and so you can have a mix of face-up and face-down cards attached to villains. What I Liked: The flavor behind this expansion is intense and these 100 cards got a long way to really changing the feel of things. You can try to play with the Noir characters together but in truth they actually integrate well with other decks as the teams are pretty diverse. Running throug the new characters added each joins a different team - Avengers, Marvel Knights, Spider Friends and X-Men. The mechanics behind Investigate and Hidden Witnesses sound pretty simple but to actually play with them makes a world of difference. Investigat rewards decks with a limited number of colors that you can predict to some degree. Hidden Witnesses are a lot more annoying at times than even those Masterminds that gather goblins and other Bystanders to guard them as preventing attacks is a strong ability. And this all adds some great challenge to your games. What Could Have Been Better: That said, purely playin with Noir characters when facing Noir Masterminds doesn't always feel like the best strategy as the heroes don't play well together. And that sort of fits the whole Noir mindset but it can be a little annoying when playing since you instinctively want to keep them together for thematic reasons. The added threat from Hidden Witnesses seems noticely higher than the rewards you get with Investigatei, and that can be a tad annoying at times. And so we do try to mix and match heroes from other sets to help optimize play unless we're going for the more challenging "fully random" system of play. TL;DR: Legendary: Noir is an expansion that has a lot of great play flavor that really gives your games a different feel. It plays better with help from other sets but it's still a solid addition to any collection. Thus the game gets 4 surprise attacks from tricky villains out of a possible 5.